Health Minister Jill Hennessy, Prof Kelsey Hegarty, the CEO of the Women's Dr Sue Matthews and Prof Glenn Bowes, Deputy Dean, Faculty of Medicine Dentistry & Health Sciences, The University of Melbourne. The Minister for Health Jill Hennessy today announced Professor Kelsey Hegarty has been appointed as Australia’s first chair of Family Violence Prevention. It will be a joint appointment by The University of Melbourne and the Royal Women’s Hospital (the Women’s). 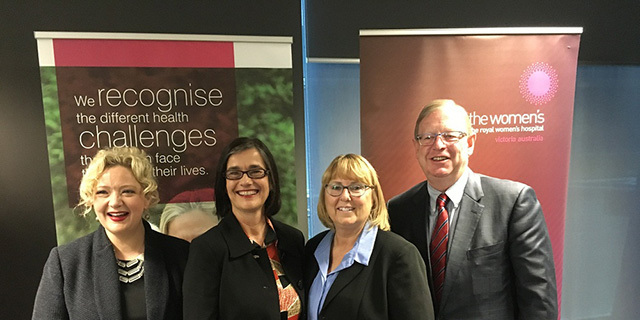 The Minister made the announcement at the first Strengthening Hospital Responses to Family Violence (SHRFV) forum in Melbourne today. It came as the World Health Organisation adopted a global plan of action at the weekend to strengthen the role of the health system to address interpersonal violence, in particular against women and girls and against children. Australia was one of 44 Member States that adopted the resolution at the 69th World Health Assembly. The new chair of Family Violence Prevention will work closely with the WHO over coming months as an expert advisor. Professor Hegarty is a leading voice at The University of Melbourne and researcher on the role of the health system in preventing family violence in Australia and globally. Minister Hennessy said hospitals and primary care settings were uniquely placed to provide women and children with a safe place to disclose that they are suffering family violence and need help. "The appointment of this Australian first chair of Family Violence Prevention is an important step in strengthening the role of our health system in responding to and preventing family violence,” she said. Professor Geoff McColl, Head of The University of Melbourne Medical School said: “The chair further develops an important element of our work as part of the new Melbourne Research Alliance to End Violence Against Women and their Children, building on existing research strengths within the university”. Chief Executive of the Women’s Dr Sue Matthews said the aim of the chair was to alleviate the burden of family violence through research, training, clinical practice and patient care across the health sector. Professor Hegarty said she was honoured to be made Australia's first chair of Family Violence, and pleased that it would unite the research efforts of The University of Melbourne and the Women’s. “This will give me the support and resources to continue researching how health practitioners and the holistic health care system can support women and children facing family violence,'' Professor Hegarty said. "We know family violence is incredibly complex and so often the victims are isolated, so we need to tap into new technologies and ensure that doctors, nurses and the health care system are supported to assist families where violence is occurring. Professor Hegarty is an academic general practitioner who co-chairs the Melbourne Research Alliance and leads an Abuse and Violence research program in the Melbourne Medical School’s Department of General Practice. Her current research includes the evidence base for interventions to prevent violence against women; educational and complex system interventions around identification of family violence in health care settings (including men who use violence) and responding to women and children exposed to abuse through health care and through the use of new technologies. For over a decade Professor Hegarty has contributed at both national and international levels to the family violence field, advising the World Health Organisation on guidelines for health practitioners and health systems change. She has developed a program of research in family violence, which began when she developed the Composite Abuse Scale, which has been used extensively globally as an outcome of intervention trials and is available in 10 languages. Professor Hegarty played a lead role in the development of the Royal Australian College of General Practitioner’s White Book on Abuse and Violence and an online learning module. She has developed innovative family violence curriculums for health practitioners and regularly teaches to undergraduates and postgraduate health practitioners. Professor Hegarty has been the chair of the governance group of the Domestic Violence Resource Centre Victoria for many years. She is also Director of the postgraduate Primary Care Nursing Course. She continues to work in general practice. WHO said its plan of action provided a strong mandate to address violence against women and girls as a global and urgent public health problem.